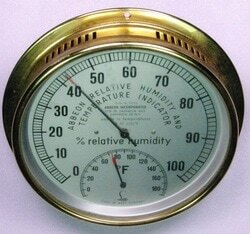 ​This is another Lufft hygrometer, which probably also uses durotherm although it doesn't say it does. Abbeon is the US representative and distributor for Lufft. The 'Made in West Germany' label would date this instrument before 1990. The dial face is about 5 inches in diameter. ​Go to Lufft catalog page.